It’s so hot. Too hot. This sort of thing has happened again and again in Canada. It’s all going downhill (in everything except the literal sense) and then a friendly Canadian pops up, offers us something amazing and the days turns around again. Today this man’s kind offer (and waterslide) saved us from wilting in the soaring mid-30s heat. Tumbling in from the waterslide instantly rejuvenated me. The “look” for Ontario is this: swim suit, sunglasses, deep tan lines on leg and cleats. It’s a style. Milan called. They want their fashionista back. Swimming is apparently good for my knee. As is cold. In Ontario that essentially equates to swimming in cool lakes. Oh yes, did I mention I’m now in Ontario? You could tell it’s Ontario even without the signpost because of the change of scenery. Gone is the flat, agricultural land. We are now cycling through the forest on endlessly undulating land. The cycling is quite challenging but much more enjoyable than Manitoba (thanks to decent tarmac). There are more bugs, more birds, more… Life. I think I could enjoy Ontario. After a long splash in the lake the heat of the day had cooled off. We still had 30km to go to Kenora. It was approaching dusk as we whizzed over the steel bridge into Kenora in a tangerine light that illuminated the lakes around us. We arrived not at the campsite but at the pub. It had been a long, hot day and we needed beer. We pulled up at campsite just before 11pm and for the first time on this trip pitch our tents in the dark. 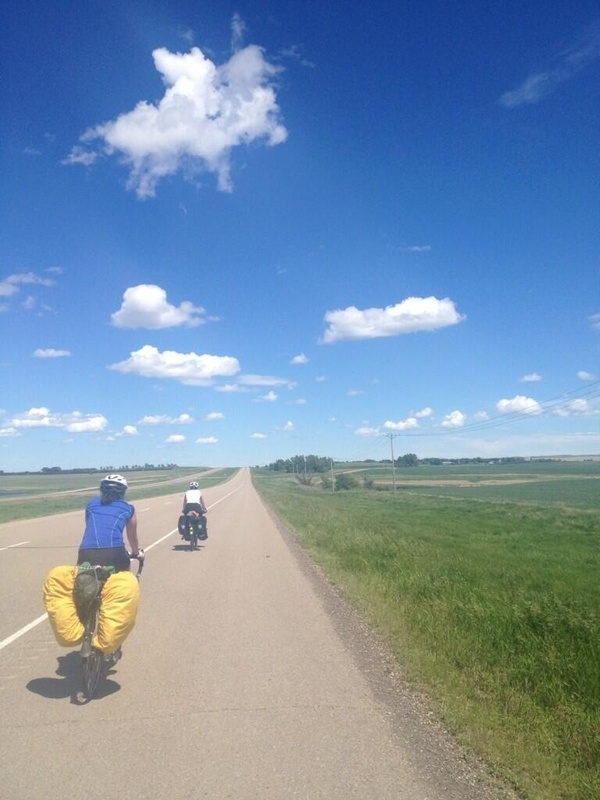 Cycling across four provinces and two time zones, I have witnessed the gradual and remarkable transformation of the Canadian landscape. And as quiet as the changing seasons, as definite as the cycle of day to night, I have experienced the transformations of my own body. The hills have become mountains. The contours of my body are changing with the landscape of Canada. 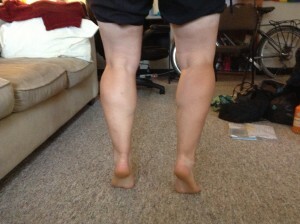 My legs look different. But more remarkably they feel different as through this journey I have discovered a new appreciation for the interior physicality of my body. The way it moves, aches, bleeds, itches, breathes, and rests. 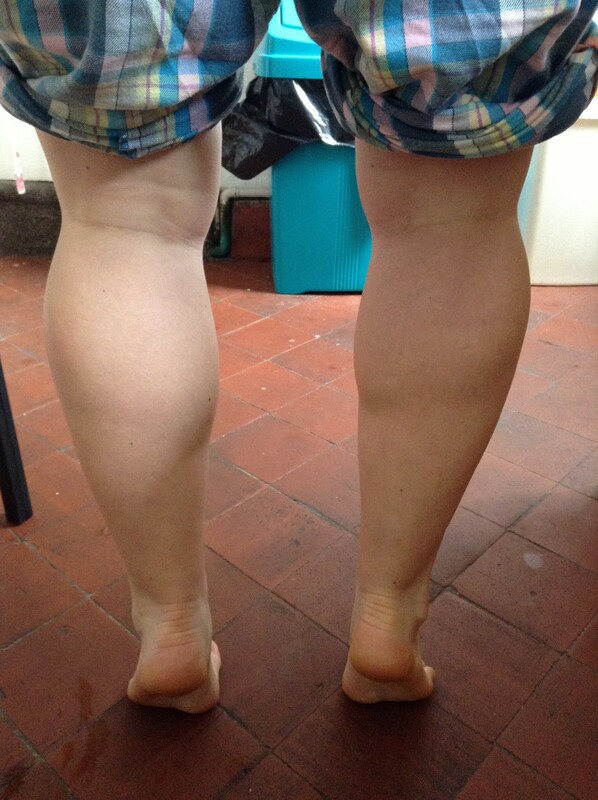 My hamstrings tighten. My quads burn. My knee stabs. My feet itch from the mosquito bites. The skin of my shoulder is peeling from the southern sun as I head continually east. A single releasing droplet of sweat rolls down my spine. And I keep on cycling. I have laid flat on the ground, my eyes dazzled by the sun and felt the hot beating of my heart against the tarmac. I have gasped for air against the ice cold shock water. Never before have I cared so much for my body. Never before have I loved it so much. At the risk of sounding like an inane fridge magnet, I am beginning to appreciate that my body is not the vehicle, it is the journey. Today I feel like I’ve earned my colours. If I started today as a rookie cycle-tourer who tries hard then I finish it as an intermediate who succeeds even when it goes wrong. Let’s be honest, today wasn’t my favourite day so far. Nor was the cycling the most enjoyable. I am now too tired to feel any emotion other than tired (if tired can be an emotion rather than just a state). Today was the day that I pedalled off by myself as the Wanderers (my companions for the last 2 weeks) wandered off because one of them really didn’t feel very well and said I should go ahead. Today was the day that I left Saskatchewan and entered Manitoba. Today I crossed a time zone without realising it because there wasn’t a sign. And I didn’t figure out I’d lost an hour until I noticed that my cellphone and iPad were displaying different times. Today was the day when I said goodbye to the nice tarmac shoulder my wheels have been hugging for weeks and bumped into the gravel shoulders of a new province. Today I swore under my breath to the provincial government that couldn’t be bothered to build decent roads when Saskatchewan’s could. Today was the day I decided that it is legitimate and probably quite wise to put your bike into a pick up truck when the town you wish to cycle through has experienced a 297mm deluge of rain in 3 hours. Today I figured out that it’s okay (and still counts as cycling across Canada) if you have to get a lift for 20km because the flash flood has meant that the houses are being pumped, the power is out, the highway is closed, the surrounding roads are swamped bumper-high in water, the cows are floating in the fields, and the government has declared a state of emergency in southern Manitoba. Picking up a passing Wanderer to avoid the floods. Today was the day that truck dodging become a reality. When sod’s law dictated time and time again that even though the road was quiet if one truck appeared behind you then another would appear in front. Today was the day when I quickly learnt to estimate which one would arrive first, to identify from the sound of the rumbling wheels whether the truck behind was pulling out, whether the other would brake, whether it would be better to pedal faster, slower, or to give in, screech on the brakes and make a 6 inch dive down onto the gravel verge to avoid a collision (either with me or between the two vehicles). Today was the day that I held on tight when the oncoming trucks blew a swirling furnace of grit into my face. Again. And again. Today was the day that the wind behind me managed to turn into a strong cross wind. When the road meandered north for no reason and I had to tack like a hopeless sailor to get just a few kilometres north before the road bent back east. Today was the first time in over a week when I climbed up what could reasonably be called a hill. I actually had to use my small front chain ring. Today was the day that I discovered a new use for my buff as a knee bandage used to hold the deep freeze cold patch onto my painful kneecap. Today was the day that I grew tired of arriving in the Middle of Nowhere. When I became bored by yet another small, dusty, pot-hole ridden town that only consists of a gas station, a patch of grass, a few houses and more gravel and dirt. Today I decided that wanted to be Somewhere. 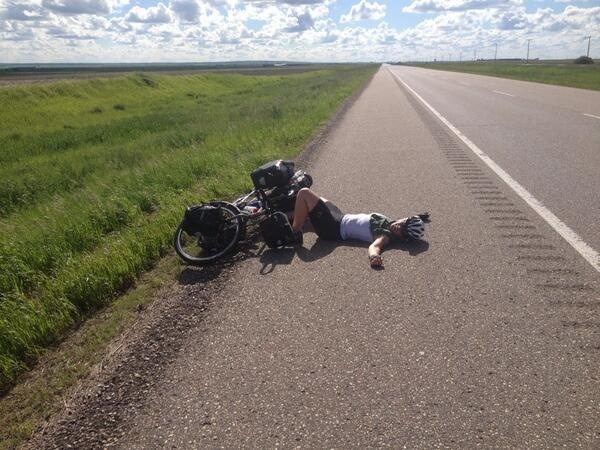 And so decided that I will cycle to Winnipeg tomorrow. 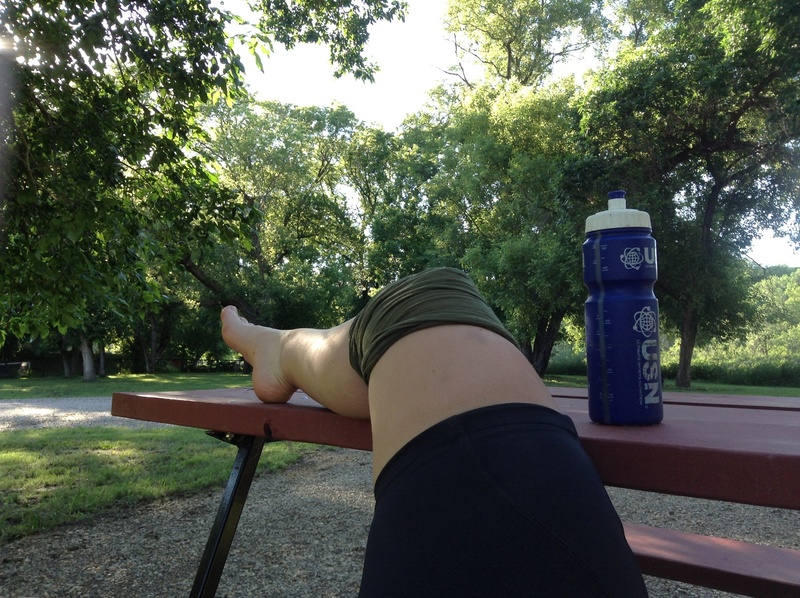 It’s 200km – further than I’ve ever cycled before by a long shot and now on six day old legs with a knee begging for a rest. But there’s Somewhere at the end of it. Somewhere with a hot shower, a cold beer and a familiar face who I am looking forward to seeing again. 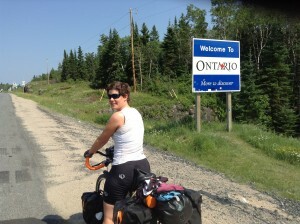 Today I decided that this cycle across Canada marlarkey is worth it. Every truck, every gravel dive, every mosquito bite and every pedal stroke: today was a lesson in how to keep going. When I said those words, sat indoors in Regina with the rain lashing outside, I hadn’t expected that the house would turn out the way it did. 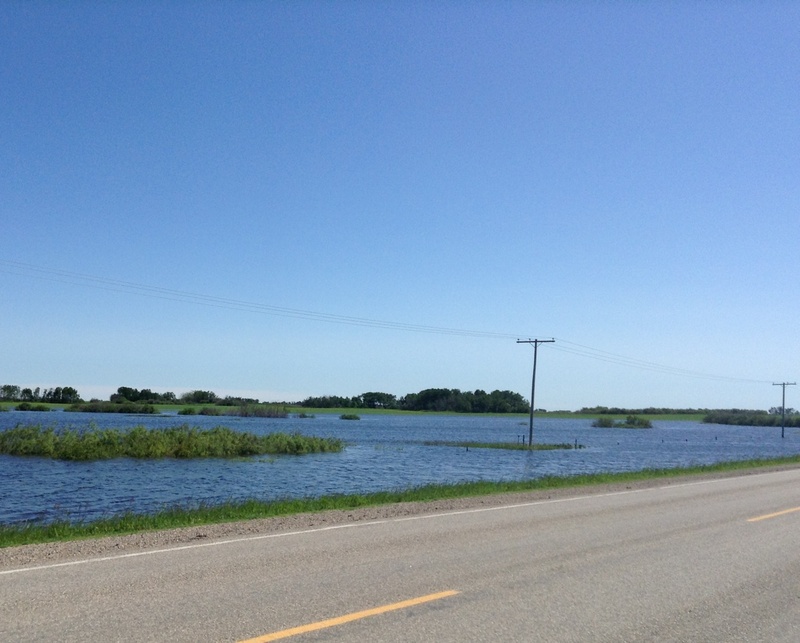 We left Regina late morning once the thunder clouds and rain had done their worst and passed to the north east. Although now dry the weather forecast for the day didn’t look good – there was a strong south-easterly wind. And today we departed the Trans Canada highway to avoid the traffic, heading instead directly into the south-easterly wind in search of quieter roads. We only succeeded in cycling a punishing 73km, many kilometres short of our intended destination of Fillmore. For lunch we sat on a patch of lawn to devour the usual selection of avocado, crackers, cheese etc. None of us wanted to move. 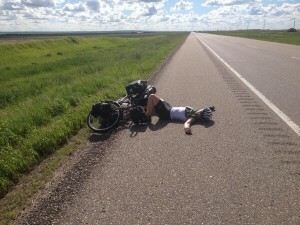 I don’t know if it was the late start, the tired legs from many miles on the road, the oppressive humidity of the air, or the unrelenting headwind but we all felt very lethargic and didn’t want to get back on the road. Cycling into a headwind isn’t very social. You can’t ride side by side and chat as it uses up so much energy and the wind will catch your words and toss them behind you before they reach the other person. To brighten things up, one of the wanderers suggested that we play leapfrog on the road. We all had the same album on our iPods (Tegan & Sara, Hearthrob) to use for the leapfrog. We lined up in formation on the road. On three we pressed a simultaneous play on our iPods and punched into the wind. I started at the front, Sofi sat right on my back wheel and Katie right behind her. We pedalled fast, head down, punching into the wind. After two songs the person at the back sprinted to the front and pedalled as fast as possible. We cut through the wind like the women’s team pursuit at the Olympics. Our average speed pushed up to 23km. My legs ached with lactic acid. They ached from all the miles I’ve cycled these last few weeks. They ached as they punched the wind. The music made me push as hard as I could until the end of the second track then Katie raced to the front. It was a relief to be about to cower on the back wheel, sheltered from the buffering wind. The pace quickened with the fast opening beats of each new song. 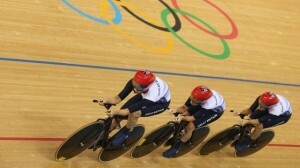 The rider at the front picked up the speed with their fresher legs. When the last song on the album began to close we were just 12 kilometres from Francis. We pulled up at the gas station. Francis is a non-location: a scattering of houses, a small gas station, a pot holed gravel road to the south. The guy behind the counter, a young guy with a Canada Badboy tshirt and a hint of stubble, informed us that there wasn’t anywhere to stay. No motel, no campground, nothing. There nearest place was to backtrack north or continue another 30km along the highway. By now it was past five in the afternoon and none of us had the energy to cycle any further into a headwind. A group of three men in boots and baseball caps were having a coffee by the window. One of them advised us that we could sleep in the sports ground in the town. Being outside in the wind didn’t look inviting so we sat in the gas station drinking diet coke waiting for the time to pass. What a relief. We cycled down the road and along a bumping, muddy track to the unfinished house. It stood like a white beacon on the horizon – it’s exposed walls shining in the low evening sun. It felt strange to be the first people staying in a new house but I’m really grateful to Becky for letting us stay. I got what I wished for: a house to sleep in. The truck pulled over behind the zigzag of bicycles scattered across the hard shoulder. Two riders sat huddled on the ground. The third lay prone on the hot tarmac, her arms outstretched but her legs still bent awkwardly around her pedals. “Oh, we’re fine,” Katie wanderer called, giving the driver thumbs up. We were fine, all of us. We’d just decided to sprint 15km in order to reach an average speed of 30km by our 100th mile. This spot on the side of the highway, bordered by fields on all sides, under the heat of the sun cooling in the late afternoon, marked our first English century. 5 hours 17 minutes and 04 seconds. This was the longest and fastest ride of my life. 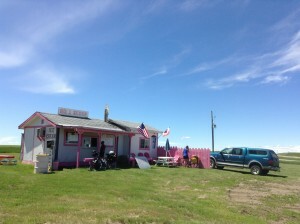 I felt lucky, and relieved, to be here as the ride to Moose Jaw had been riddled with problems. 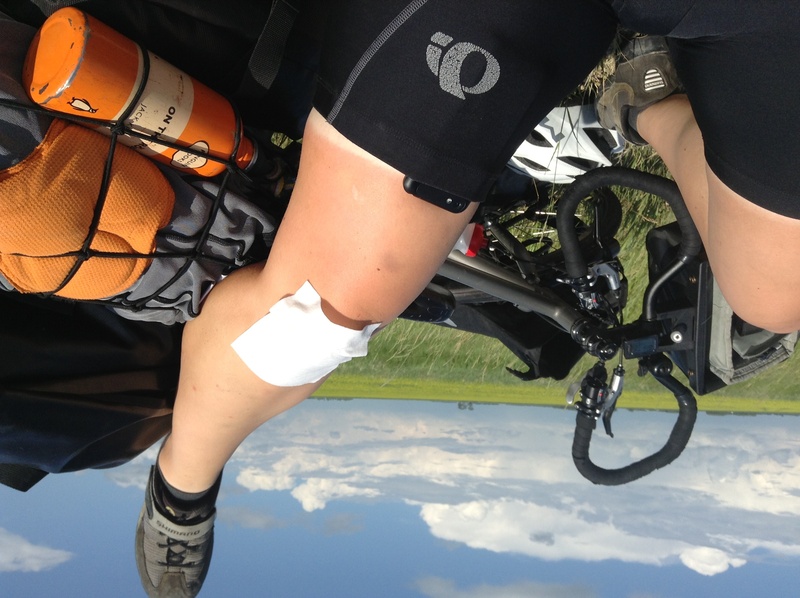 Yesterday we’d had perfect weather for the 173km ride but while loading up my panniers in the morning I noticed a problem. Uh-oh. Broken spoke. As we cycled to the bike shop I was muttering under my breath” I don’t like bike shops, I don’t like bike shops.” Seriously, as a girl in a bike shop I usually get either ignored or patronised (sometimes they actually manage to do both). I was not looking forward to this. Lo and behold I wheeled Monty in the door and over to the mechanic’s stand. The main mechanic takes a look at Monty and then before I’ve had a chance to open my mouth measures the chain and tells me I need a new one and possibly a new cassette. Seriously? I have a broken spoke. Please can we focus on that. The guys in the shop were bimbling around and I was keen to get Monty fixed and on the road as soon as possible. “Oh, we don’t have a spoke that will fit so will have to cut one” the guy says. “I have a spare,” I interject, burrowing into my panniers. Out comes the spoke. The guys in the bike shop are still bimbling so I thread it myself. “Excuse me, where’s the grease?” I ask. I fit the spoke and head over to the trueing stand. Mr Mechanic has now spied what I am up to. “I have 30 years of experience.” Mr mechanic announces, puffing out his chest, “some of these guys in here have 5 or 6 years experience but I won’t let them do this.” There’s a pause as Mr Mechanic notices the flame of determination in the crazy English girl’s eyes. “But I’ll let you have a go.” Clearly he expected me to fail. Wheel building is supposed to be a dark art. Mr Mechanic clearly didn’t expect his customers to start boiling the magical cauldron by themselves. But he hasn’t accounted for me. Geez. 30 years experience to learn the hocus pocus of making a bit of metal straight? My Dad and I built a wheel on Boxing Day last year and its been good since. My Dad just printed the instructions off the Internet and we went through bit by bit. It’s not actually a dark art. I carried on trueing the wheel. Then with the help of the wanderers put the cassette back on and was tightening it with a wrench when Mr Mechanic came over again. I’m sure he wanted to diss my work but he crouched on the floor, spun my wheel and it was true. Ha! Given that I’d used only my own components and my own labour they didn’t charge me anything although I did buy a spare chain and some energy gels. We wheeled out the bike shop. By this time it’s midday, the sky is beginning to cloud over and riding to Moose Jaw seemed a little ambitious. The wanderers suggested we make it a rest day- a wise decision. We wheeled over the road to the market. Folk music is playing in the town square surrounded by stalls of fresh produce and crafts. Last night’s host, Sarah, has already sold out of bread but is still at the stall selling the last of her cinnamon buns and cookies. We stop to eat a scone. I check Monty’s back wheel again. Uh-oh. there’s a bulge in the back wheel. I take Monty back over the road to the bike shop for a second opinion. Mr Mechanic thinks he’s fine but just as he is checking it my Dad phones. My Dad advises swapping the tyres and fitting the chain. So I do. (Funny how I prefer the opinion of someone on holiday in the Azores over the opinion of a mechanic standing right next to my bike.) It’s now that we realise the the chain I’ve been sold is too short (note to self it’s a 114 link chain). They have to get a new one, soak it in paraffin wax etc. The wanderers have all bought new chains from the shop. We sit on the floor of the bike shop, Saskatoon berry scone in one hand, greasy finger on other hand counting the chain links in their bikes. We count the chain links four times: yep, they are 114 link chains. Their chains are too short so they have to be swapped. Eventually Monty has a new chain fitted and it fits. The wanderers have spare chains. We’ve been in the bike shop for the best part of five hours (!) and no way are we going to make it to Moose Jaw. 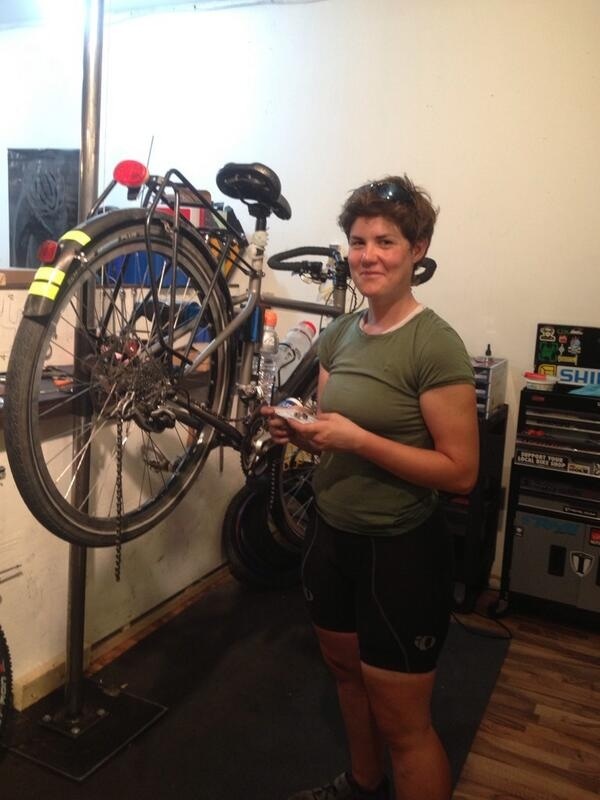 This morning at the very same point in packing up our panniers Sofi noticed that her rear back wheel was flat. A nasty bit of metal that looked like a twisted staple had got in. Oh well. 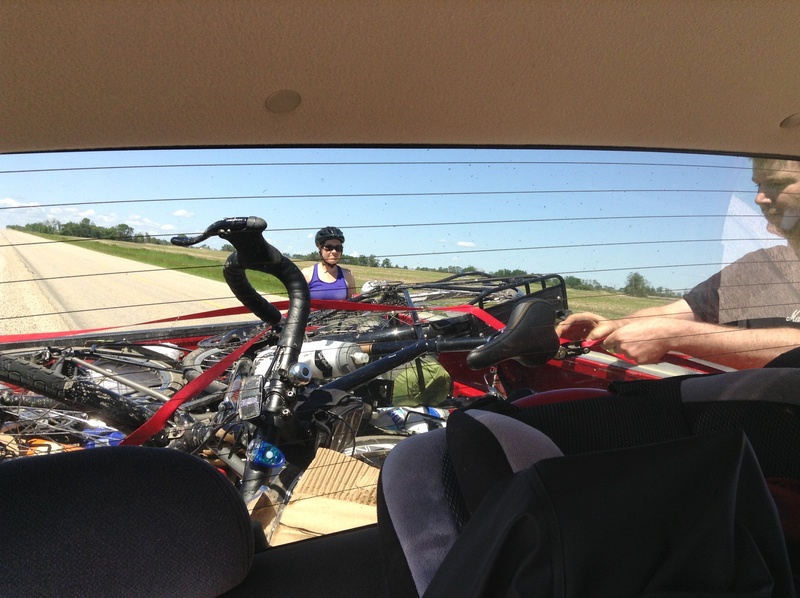 We flipped the bike over, changed the tube and were on our way in half an hour. 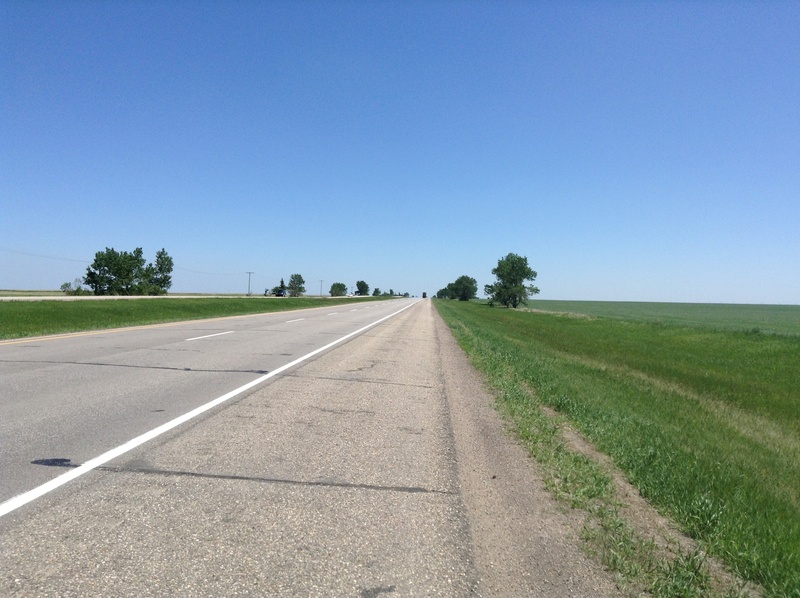 All morning we cycled to the sound track of the prairies: the rapping of the wind against anything that will flap, the occasional gull or black bird calling, the quick ticking of the freewheel hub and the off beat clunks of a gear change. The wind was behind us slowly picking up strength. 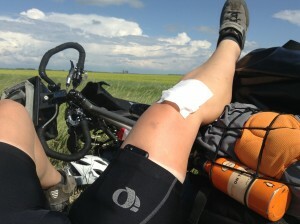 This is cycling in the prairies at its best. We cycled past treeless green fields. At one point we passed Chaplin Lake, the second largest salt water lake in Canada and home to sanderlings and plover. From a distance the piles of salt around Chaplin look more like smudgy snow. But in the process of pumping up the inner pump (or more precisely Dino and Sofi shuffling around to change turns pumping while holding both bikes all upright) Sofi’s bike fell over. All our hard pumped air burst out as the nozzle bit of the inner tube snapped off. Erm… Time to get the spare tube out. Fail. We pedalled on happily all afternoon. At 145km I noticed that our average speed was, thanks to the wind, 29.7km per hour. Do you reckon we can get to 30km per hour? We set ourselves the challenge of pushing our average speed up to 30km by the time we reached our English century (ie the 100mile mark). With 15km to go we pushed up the pace to 37km per hour on the flat and raced up every curving incline. Katie and I had it in our minds to reach the desired 30km per hour speed and then just maintain it. By 150km we’d ticked over to 30km average speed. But Sofi hadn’t got the memo about just maintaining the pace and pushed off faster and faster – now up to 40km per hour. Katie and I pedalled as fast as we could to keep up. The tempo got faster and faster. The kilometres dropped. “Century!” I yelled. Slamming in the brakes and rolling onto the hot tarmac to cool down. My heart pounded throughout my body, I could feel it beating against the road. Our wanderers too had screeched to a halt and their bikes lay like road kill smeared across the shoulder. We were fine. We’d just done the longest and fastest ride of our lives. 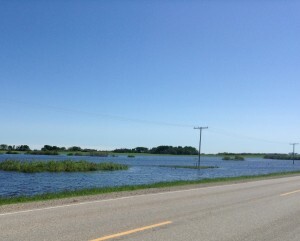 And we still had 13km to go to Moose Jaw. Is this happening? Or is this just a dream? As previously mentioned, the prairies could drive you crazy. Today I began to wonder whether I was hallucinating in the heat – in a good way. It’s been that sort of day. I was fired up for our epic 137km of riding today. 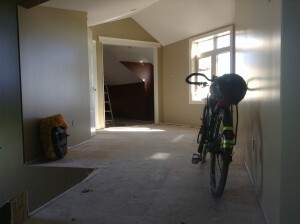 It would be the longest ride I’d ever done so to energies I drank a litre of coffee. We all plugged in our iPods to listen to some tunes to make the ride more enjoyable.The surrounding hills all look like an endless… Golf course. Undulating slopes. No trees. Green, green freshly mown grass. You need a few tunes to make the five hours of cycling through an monotonous golf course just that bit more interesting. Yes, this really happened. We had a flat in the Middle of Nowhere and a track pump turns up. A few kilometres later we are still in the Middle of Nowhere (theme emerging) when we swing round a rare bend in the road to find..
Are you serious? An icecream stall with 20 flavours of delicious and colourful calories lovely piled into a waffle cone? You’d be lucky to find Kalua Chocolate Fudge icecream in the centre of Oxford and here it is in the Middle of Nowhere. As we were tucking into our cones an RV (translation: caravan) turns up with 9 men looking like leprechauns dressed as Tiger Woods. Eh? 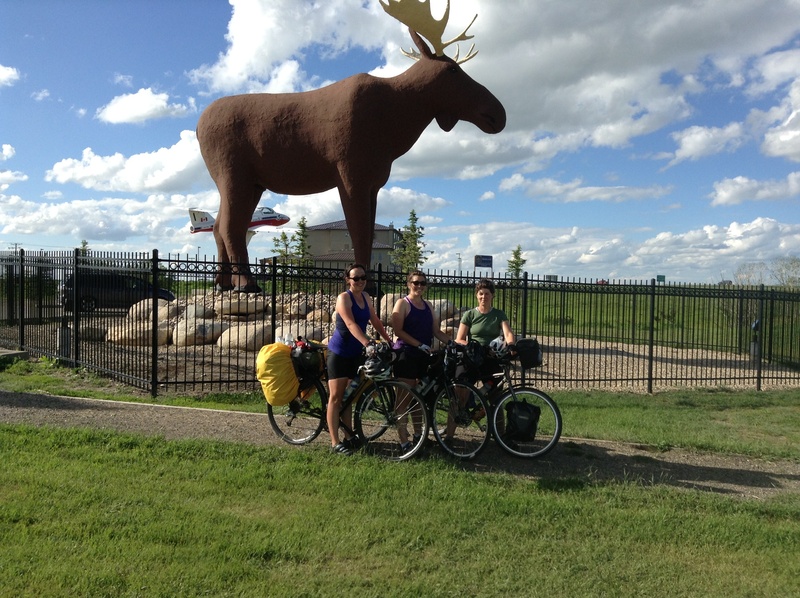 In turned out these guys were doing a mini gold tour of southern Saskatchewan. The whole get up of these guys seemed very Hunter S. Thompson. We witnessed the grim sight of one of these guys (the one who’d lost the last golf game) being cajoled by his mates into eating an icecream decorated with their choice of toppings. “Wait, lemme get some dead bugs off the windshield,” one of them called. Returning a few minutes later he added his toppings to the collection of dried grass and dandelions already on the vanilla scoop. They filmed as this guy munched the icecream. Eew. Finally we arrived in Swift Current. Luckily we are staying with a baker. 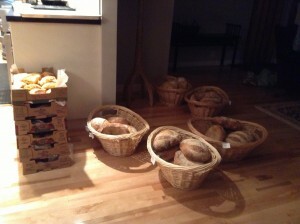 As soon as she opened the door to greet us a warm smell of fresh bread waffled out the hallway. We merrily munched away at the still-hot cheese and jalapeño scones we were given, pleased to have completed our longest bike ride ever. A sweet end to the dream of a day’s cycling.